A few weeks ago I went to Manhattan to hang out with my friend Maureen and to see the a musical at the Imperial Theater on Broadway that we'd been deferring. After the three young dancers who trade off the staring role won a Tony award, I felt there was no time like the present to make the trip. The show far exceeded my expectations. With the exception of the act mid-show with the dancing puppets, I thought the show was five star. David Alvarez was the actor the night that we went. He is an amazing dancer and athlete. 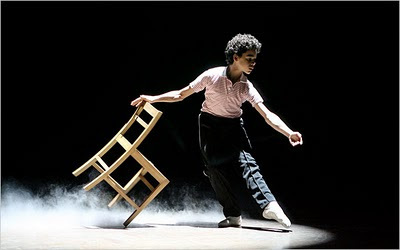 David Alvarez, one of three actors alternating in the title role of "Billy Elliot," with a score by Elton John, at the Imperial Theater. These are all photos taken from the new Highline Park. The Park is built on a raised platform that formerly supported railway traffic north/south along the west side of Manhattan. The Highline is planted using native grasses and trees and designed to be inviting to people and native wildlife. It provides beautiful vantages in every direction. The park was open from 13th to 20th streets. But it looked as though they were working to make more of the raised platform usable from 20th to 21st. It would be a great park to see in different seasons of the year.